One of the things I love about my neck of the woods is that about twice a year the courtyard at 1619 Silver Lake Boulevard something new and unreal gets installed. Such is the case with Materials & Applications current project called Density Fields, which went live October 12 and definitely puts the “can” in cantilever. 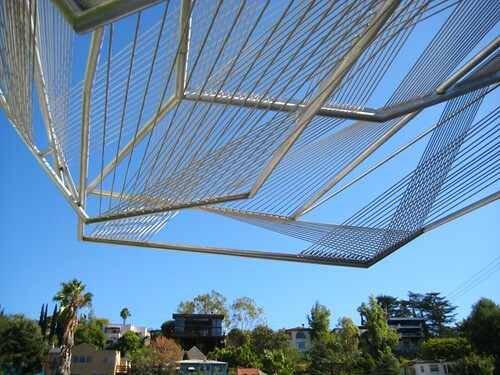 An “extreme cantilever” built from aluminum and polypropylene rope will hover over the courtyard of Materials & Applications (M&A) in Silver Lake, Los Angeles. This structure is an outdoor installation created by SCI-Arc professors Dwayne Oyler and Jenny Wu, called Density Fields. Defying classification as either sculpture or architecture, the piece will flex with a gesture that extends imaginary lines of force beyond the small courtyard, seeming to pierce buildings and features in the neighborhood.